The Jimi Hendrix Experience's mythic U.S. debut performance! Numbered edition pressed on 180-gram vinyl at Quality Record Pressings! Experience Hendrix LLC and Sony Music's Legacy Recordings are releasing The Jimi Hendrix Experience Live At Monterey on 180-gram audiophile-grade vinyl. 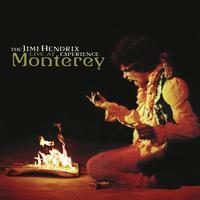 Live At Monterey was mastered using an all-analogue technique by renowned audio engineer Bernie Grundman and pressed by Quality Record Pressings (QRP), the plant responsible for last year's People, Hell & Angels, among many other titles in the Hendrix canon. Each copy is individually numbered, and includes an essay written in 2007 by Jimi Hendrix Experience drummer Mitch Mitchell. He passed away the next year after completing the 2008 edition of the Experience Hendrix all-star tribute tour. Live At Monterey captures The Jimi Hendrix Experience's mythic U.S. debut performance on June 18, 1967 at the Monterey Pop Festival. A captivated California audience witnessed the original band line up of Hendrix, Mitchell and bassist Noel Redding blaze through soon-to-be-classic originals such as "Foxey Lady," "The Wind Cries Mary," and "Purple Haze," as well as transformative versions of Bob Dylan's "Like A Rolling Stone," and The Troggs' "Wild Thing" before Hendrix set his guitar ablaze. This show is credited as having launched The Jimi Hendrix Experience into superstardom; they would go on to become the highest grossing touring act in the U.S. soon thereafter.